I am giving birth to a new "Your Army" thread. This is just a sugestion on how to go about describing "Your Army". -how the climate would affect your troops. -Where your general would be postioned. -Would who have priests clense your army? As you can tell from above my army consists of mostly light units and more specificly recurve bowmen. The recurve bowmen are trained to shoot from a long distance and rain arrows upon their targets. The archers have light leather armour and cloth armour, with some wearing scale armour. This provides full mobility to the user. Since my army relies highly upon archers, they are trained from a very young age or they are recruited from tribes who rely upon the bow for food. My army would most be known for its bowmen, as it is its signature unit. Short Spearmen are trained to fight with a spear at close combat. At one end of the spear there is a sharp spearpoint, at the other end is a blunt knob. This creates fast successive hits to the enemy. The axemen are trained to fight close at close quarters with their axes. They are trained to throw their weapons as well as to use it as a melee weapon. The axe is made as light as possible for quick chopping maneuvers. Used to run down retreating enemy brigades, flanking maneauvers, anti-cavalry action, and skirmishes. Similar roles to that of the spear cavalry, using a blunt mace to break bones, rather than the sharp piercing weapon of the spear cavalry. Used for flanking maneuvers, cavalry charges, and skirmishes. Scale armour protecting the animal's flanks, buttocks, and facial region. The underbelly is kept free of armour, as to give the animal natural mobility, and an area to allow for air flow. Period: Late Renn-Early 17th century? The 6,400 Usaria are armed with shields, three quarter plate armour and maille with a 10mm thick cuirass of the anime (no, not the cartoons) style with wings attached to the back. The armour is burnished and trimmed in gold. They have a 25 foot, hollow lance with a thin steel rod that gives it enough flex to impale up to four people and keeps it from cut in half by enemy blades, Czekan (warhammer) two swords one a saber and one a long narrow thrusting blade, dagger, four pistols, a bow and arrows and a carbine. They ride well trained destriers and they have remounts. The Usaria are to destroy enemy cavalry and infantry on the field with the strength of their furious charge supported by their missile weapons and the polish artillery and missile troops they also outreach pikes because of their length of their lances with outreach even the longest pikes by eight feet enableing them to impale up to 4 people cavalry and infantry alike. The Usaria are trained in every type of known cavalry tactics and are cross trained as well as being masters of their weapons and horses. They bear bows, sword, dagger, pistols, a light lance and wear maille armour and a helmet. Their job is exploitation and pursuit, reccon, scouting, foraging, harassment, feints, diversions, ambushes, etc. They wear: Helms, arm pieces, leg pieces, plate cuirasses like the Usaria and carry a sword, dagger, pike, and pistol. Arqubursiers are indentical except they carry an arqubus instead of pike. Their job is to steamroll the enemy infantry and speedbump enemy cavalry via combined arms tactics. And to provide a walking fortress where friendly troops can regain their strength before charging out again. Six pound field guns that are cast and to the same exacting standards every time and the powder is standardized as well. The crew are armoured and geared like the infantry. They are cross trained. Their job is to soften up the enemy while the other troops exploit the gaps. Describe things such as . . .
-how the climate would affect your troops. Not much seeing as how it's what their used to and they live there. -Where your general would be postioned: Middle and center. -Strategy: Varies with the campaign and/or war. -Troop Placement: Usually? The Usaria front and center to smash the enemy and keep the enemy watching them so my medium cavalry can get up to all kinds of mischief, with the medium cavalry at the rear split into three formations to guard the rear, flanks, artillery and infantry. The artillery on the right flank and rear to shoot up the enemy, the infantry on the left to hold enemy troops and shelter exhausted friendly soldiers. -Why would you fight: Territory, money, good land to breed horses, defense of territory, etc. -Uniforms: Red tunics and cloaks, leather gloves, thick socks, high doubled black boots, black or grey trousers and smallclothes. -Anything you can think of . . . I would pay pseical attention to logistics and resources then worry about strategy and when the was a battle then worry about the tactics. I would give full quarter to anyone who surrendered anyone who violates deliberataly would be killed. I would have chaplains and surgeons to care for the troops bodies and souls. I also have a very mobile force of field cooks. Anyone except camp followers would at least know one end of the armies weapons from another. Civilians would be unmolested under pain of death and anything like cattle, property or a field of crops that were damaged by marching troops would be repaid anything troops wanted from civilians would be paid for and sold voluntarily. Medical care would be provided to any civilians who needed it. Looting and pillaging except from dead enemy soldiers is prohibited under pain of death. Soldiers would be required to bathe regularly keep themselves and clean and clipped and check up with the surgeons. There would also be facilities for care of the horses and repair shops for damaged gear. I would also have supplu dumps around the country as well. Short Spearmen are trained to fight with a spear at close combat. At one end of the spear there is a sharp spearpoint, at the other end is a blunt knob. This creates fast successive hits to the enemy. Medium sized wicker sheild. The axemen are trained to fight close at close quarters with their axes. They are trained to throw their weapons as well as to use it as a melee weapon. The axe is made as light as possible for quick chopping maneuvers. Small wicker shields. Used to run down retreating enemy brigades, flanking maneauvers, anti-cavalry action, and skirmishes. Smaller wicker shields. Similar roles to that of the spear cavalry, using a blunt mace to break bones, rather than the sharp piercing weapon of the spear cavalry. Smaller wicker sheilds. A shock troop weilding a chopping axe with a sharp axe. A slight hook at the end allows for the dismounting of enemy mounted troops. Scale armour is used. Scale armour and a large wicker shield. Used to create shield walls and stop the enemy advance. Weilding the blunt weapon of the mace with some men carrying spiked clubs. Both are used to insight fear in the enemy. Scale armour is also used. The sub-tropics from which my people reside is filled with military advantages. If present archers are placed in palm groves. River reeds are used to create wicker shields and arrows for my large archer corp. Located in a safe position in the army centre. Normally he is on his nimble mount or on a light chariot, for quick maneuvers and retreat if need be. Heavy infantry are place in the centre, followed by light infantry along the ends followed by the cavalry. Archer units are placed behind the infantry line. In addtion to the tradtional line formation, the wedge formation is also used. Get back to it later. The LAWGIVERS IPPEIS and ELITE PHALANX were both mobilised to support Pisistratus' return to Athens in c.546 in the battle of Pallane. The previous generation aided Cleisthenes of Sicyon to besiege Kirrha in the first Sacred War in c.595 - 585. Like their fellow Dorian Sicyonians, Spartans and various others, these divisions - along with the CITIZEN PHALANX - regularly have to quell "Helot" insurrections in the countryside outside Nikopolis. All of these units, including the THETES, have been involved in paramilitary activities against subversive elements in Nikopolis trying to overthrow the tyranny of Astros II. Manuevers - Predictable 6th century hoplite warfare - some early "hammer and anvil" tactics are utilised, placing more emphasis on cavalry and skirmisher screens than is historically justifiable for this period. Dangerous and implusive adventurism, mixed with family ties and keeping down the helots would be the chief reasons for military engagements - alongside kleos and spoils to donate to Delphi and other sanctuaries. The army would by symbolised by an orange diadem on the shields entwined with a letter Nu. Camp followers are generally not needed - the helots do most of the cooking and stuff for the hoplite phalanx. Astros II doesn't care about hubris, and won't turn back when the entrails show trouble ahead, much to the dismay of the local lyric poets and rhapsodes. Looting throughout the countryside can get endemic - long campaigns to help fellow tyrants can wreck havok with logistics and supplies. Our mission is to out wit, out hit and out post intruding newbs, trolls and disgruntled surfers. metal spiked mice, poisonous keyboards, fast internet connection, superb pm system for efficient battlefield strategy, usage of Hidden Postal Options, ability to suspend battles at will, capable spy network; ability to edit, remove and mutilate nauseating posts and maps with ease. The axemen are trained to fight close at close quarters with their axes. They are trained to throw their weapons as well as to use it as a melee weapon. The axe is made as light as possible for quick chopping maneuvers. Carries the Taka sheild. The sub-tropics from which my people reside is filled with military advantages. If present archers are placed in palm groves. River reeds are used to create wicker shields and arrows for my large archer corp. My army would use the woods to their advantage, quickly attacking, then retreating back into the woods. My army would rarely fight conventional battles, most battles would be guerilla wars, long, drawn out, and bloody. The enemy supply lines would be destroyed, the enemy would have their scalps cut, and torture would be used to its greatest effect. The forest would be used to the warrior's advantage, attacking then retreating back into the woods. Heavy infantry are place in the centre, followed by light infantry along the ends followed by the cavalry. Archer units are placed behind the infantry line. The sparabara protects archers to form a solid shield wall, halting enemy advances. In addtion to the tradtional line formation, the wedge formation, and crescent formation are used. My army would fight during periods where the weather worked in its favour. The standard colour would be blue. No standard uniforms would be issued. The tribesman would have relative freedom in the choice of their armour, clothing, and armaments. To protect our homelands, and spread our influence. I would hate to face yours, Darius. 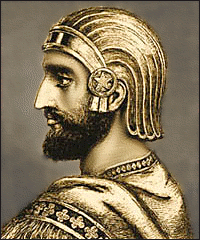 My army resembles the early Achaemenid army. Regardless, your Archon era army is quite the formidable force. On progress...I'm gonna work on this later. But Sarissa Phalanx? In 800 BC? I just didn't want to leave Sarissa outside, while commanding an Iron age army. I'm going to do a Diadochi one soon - expect lots of Asian Elephants (from one of the Chandraguptas), a vast phalanx with a mixed agema - standard phalangite formation, hypastists and persian mercenaries on the flanks, support phalanxes of Machimoi native phalangties, Attalid and Parthian cavalry wings, and Persian missile cavalry! It would and is usually deployed with the Light troops on the left the Medium troops with heavy cavalry in center and my Historical division on the right.